Signs to look for that a garage door is at the end of its useful life include lack of insulation and modern safety features, air seals that are torn and worn out, and dents and breaks in the door. Fiberglass garage doors will often fracture upon impact. If this happens, the door’s safety is compromised. When the door is in the full overhead open position, part of the door could fall off due to the fracture and cause serious damage to nearby items, and even more serious injury to anybody standing under or near it when the break occurs. Likewise, garage doors with considerable dents also pose a safety risk as misshapen doors can interfere with the smooth operation of automatic door openers. If any part of a metal garage door is dented outward, or inward, in such as way that it makes contact with the ceiling or any other object or portion of the opener mechanism, malfunctions will occur. In this event, the door should be fully closed then detached from the automatic opener until a garage door service can install a replacement. 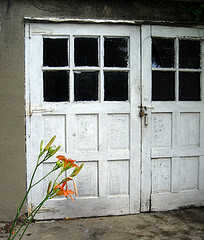 Safety is an important consideration with garage doors. Because they are heavy and are usually hung from overhead, the risk of a door, or part of a door, falling and causing property damage or injury to people and pets should be carefully avoided. If an existing door’s safety features falter, it should not be used and must be replaced. Every garage door must have bump sensors that automatically reverse and raise the door if it bumps anything on the way down. To test that this feature is fully functional, put a block of wood under the door and attempt to close it with the automatic opener. If the door does not reverse on its own, the bump sensors are no longer working. While garage doors can last many years with regular maintenance, safety concerns are the number one reason to replace old doors. Of course aesthetic style and energy efficiency are also important. However, if a door shows signs of dangerous wear and tear, getting a replacement garage door should not be put off. This article was posted in garage door and tagged garage door, Garage Door Maintenance, garage door repair, garage door replacement, steel garage door, wood garage door. Bookmark the permalink. I can see why someone would want to replace their garage door with a new model, especially in the winter. I like that you mention how the seals around the garage door wear over time and air loss occurs. Having cold air get into the house is never fun and can affect energy bills, so getting a more efficient model sounds like a smart choice.